Peterborough Sports' striker Avelino Vieira (blue) on the attack against Oadby. Inspirational manager Jimmy Dean has hailed the ‘huge progress’ made by Peterborough Sports in the last two seasons. 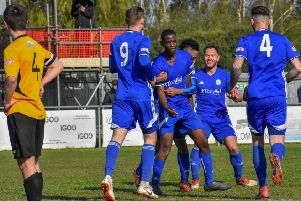 Sports’ promotion to step four football was confirmed last weekend (March 18) when a 4-0 home win over Oadby guaranteed the top three finish in the United Counties Premier Division they required to confirm back-to-back elevations. Richard Jones (5) of Peterborough Sports shoots at the Oadby goal. Sports remain a maximum of seven points (from seven games) away from winning the title, but only mug punters would back against them. “Back to back UCL titles was always my aim,” Dean stated. “No team has ever done that before, but we will. “I’ve actually been disappointed with the competition this season. We recruited well in the summer and the players have been brilliant, but it’s been a bit boring since Christmas. Our standards dropped, we stopped playing with our normal panache, and yet we are still 20 games unbeaten. It still hurts me that we missed our one shot at going a long way in the FA Vase. We had a chance in that, playing at our best. “But that just shows the huge progress we’ve made as a club in the last two seasons and it’s not just on the pitch. Our average gate has increased from about 40 to 100 and next season should be even better. Peterborough Sports manager Jimmy Dean. Sports supremo Stephen ‘Tommy’ Cooper has frozen season tickets for next season at £30 for existing holders . It’s just £40 for new season ticket holders, £25 for over 65s, and £10 for 11-16 year olds. Sports travel to Boston Town in the UCL tomorrow (March 25) before hosting Potton in the semi-final of the Hinchingbrooke Cup on Tuesday (March 28). Deeping Rangers entertain Wisbech St Mary in the other semi-final on April 4. Division One South: Leek Town v Spalding Utd, Stamford v Gresley. Premier Division: Boston Town v Peterborough Sports, Deeping Rangers v Rothwell Corinthians, Harborough Town v Holbeach United, Northampton ON Chenecks v Peterborough Northern Star, Sleaford Town v Wisbech Town. Division One: Long Buckby v Bourne Town. Division One: March Town United v Holland FC, Wisbech St Mary v Haverhill Borough.